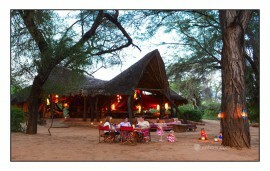 Joy’s Camp is located between Isiolo and Archers Post towns and connects to the Samburu and Buffalo springs reserves. Joy’s camp Shaba can be reached via plane through the Shaba airstrip located 15 minutes from the camp. 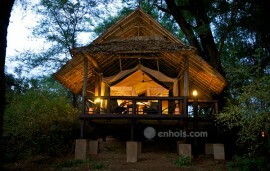 It offers an authentic wilderness experience on the remote northern part of Kenya. It has beautiful scenery and a nomadic tribe called the Boran. The big cats, elephant herds, buffalos and other species of animals adapted to living in arid areas all reside in this region. 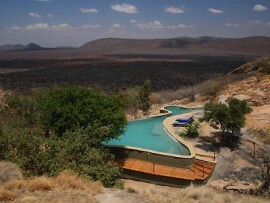 The camp overlooks a large natural spring where elephant and lion jostle for water with herds of buffalo and the rare species of Beisa Oryx, grevy’s zebra and reticulated giraffe. Joy’s camp has 7 double and 3 twin tents uniquely decorated by handmade glass and locally made fabrics to create a stylish camp. The tents consist of a large main bedroom, an en-suite bathroom with stone floors, flushing toilet and hot shower with a seating area and verandah. Joy’s Campp has conference facilities that are inclusive of LCD projectors, videos, flipcharts and well trained staff.